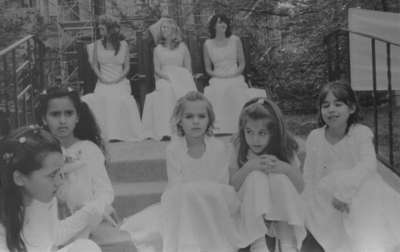 This is a black and white photograph of the Centennial May Court Festival at Trafalgar Castle School. Back Row: Sabrina Van Gyzen (Counselor), Harriet Bynon-Murray (May Queen), Caroline Bravo (Counselor). Front Row: Emily Huxter, Hannah Huxter, Sarah Mauceri, Manelle McInroy.